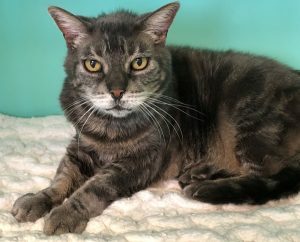 AGE: Ella is a loveable 12-year-old tabby whose family moved out of the country and could not take her with them. PERSONALITY: She was once a mighty huntress, but now, in her retirement years, prefers to be indoors-only, in a calm home where she can spend her days enjoying the loving attention of her people, telling you her story, and snoozing on a sunny bench or in her soft bed. HIGHLIGHTS: Ella is a gentle kitty who got along with cats and dogs in her former home. Her adoption fee has already been paid by a generous donor, so if you have the right home for big-hearted Ella, she is ready to be your new best friend. COST: Ella’s adoption fee has been pre-paid and includes a free wellness visit at a local veterinarian office. Ella is spayed.